By choosing to take breaks from Facebook — or changing the way we use social media — we can boost our happiness. 11. End your negative patterns of thinking. Let’s face it: Sometimes we are what’s making us miserable. We just can’t stop thinking about how so-and-so wronged us, or how our life didn’t turn out as we hoped. Negative thought processes — like worrying, ruminating, self-judgment, and fearing rejection — just keep us miserable and unable to move forward. When you find yourself thinking negatively, pause and refocus your thoughts. 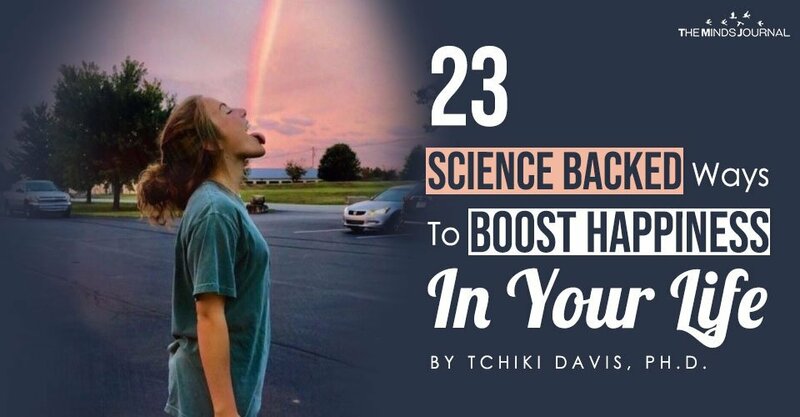 In time, your brain will be able to do this more easily on its own. How are you supposed to move your life forward when you don’t even know what you feel or why you feel it? To become happier, try to gain clarity on your emotions; find out what you’re feeling and what caused those feelings. When you start to explore yourself and your values, you may discover that you’ve known all along what would make you happy, but you’re just not doing it. To be happier, get clear on your values, so that you can live your life autonomously, according to your own principles and values. 14. Pay attention to the good. Sure, sometimes life is hard. But by paying attention to the good, you can rise above it and be more resilient. When you find the good, savor the moment, and bring it with you to maintain happiness even during hard times. Or try thinking about a time in the future when you’ll feel better. 15. Use your imagination to create the life you seek. Did you know that your brain has a difficult time differentiating between things that happen in your imagination and things that happen in real life? So when you imagine something — even happiness — your brain acts as if it’s real. We can use imagination to help create happiness out of thin air and enjoy our experiences more. Sometimes we want to escape. The world seems dark and scary, but by practicing mindfulness we experience more fully both the positive and the negative — we are more fully engaged in our lives. 17. Explore what happiness means to you. We all define happiness in different ways. When you know what happiness means to you, you’ll have an easier time finding it. So explore happiness — what it means, what it looks like, and what it feels like — to more easily create it. How are you supposed to change your life by doing the same things you’ve always done? It’s pretty tough. Instead, push yourself to overcome fear and approach life with enthusiasm. Try “doing the opposite” to see how it feels and to make your brain more flexible.